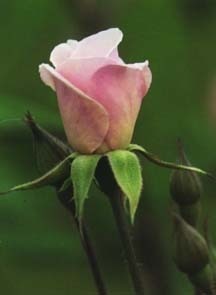 description for "Modern Roses: Rosa 'Cecile Brunner'"
'Cecile Brunner' was was nicknamed for its absolutely perfect little pink buds, The Sweetheart Rose. It is a treasure and should be in every garden, where it will bloom from mid-spring until frost. The bush form remains compact, putting up sprays of lightly fragrant flowers that look like tiny, high centered Hybrid Teas. Long lived and healthy, 'Cecile Brunner' tolerates everything from poor soil to partial shade. This is the climbing form of 'Cecile Brunner'. This rose shows excellent disease resistance, making gardening success even easier. reviews for "Modern Roses: Rosa 'Cecile Brunner'"